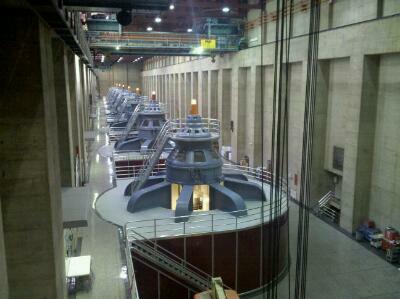 Posted bytruk	 7/27/2010 7/27/2010 1 Comment on Damn, That’s a Big Dam! 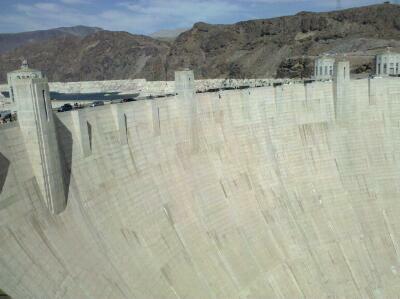 On our way out of town, we made time to swing by the Hoover Dam, so we could check it out from the ground. I found the tour a bit ho-hum (we only did the standard tour, not the $30 one that features the modern art and takes you through large parts of the dam), and the one hour of stop-and-go traffic to travel the last four miles get near the dam really sucked. 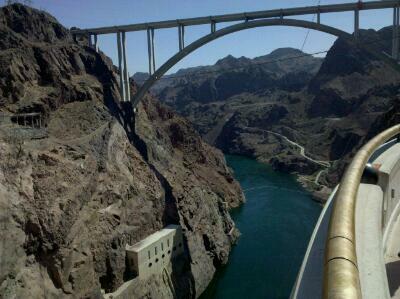 However, standing up on the observation deck of the dam offers an amazing view of the structure and explains why it is one of the modern architectural wonders of the world. The standard tour takes you into one of the thru-way tunnels and one of the generator rooms, which are impressive and worth seeing. Even though the more expensive tour has more of the modernist art on display, you can still see a bit of Oskar J.W. Hansen’s and Allen Tupper True’s work, particularly the tile and statues, on the standard tour. Upon leaving, we drove along Highway 93, over the dam, which will supposedly (and hopefully) be closed to traffic some time later this year. The number of cars looking to cross the dam really far exceeds the capacity (and occasionally the width) of the road, but I hope they leave the dam open for pedestrian traffic, as it really helps to walk beside it in order to grasp the sheer size of the thing. After that, we headed for I-40 and the 1550 mile trip home, which we drove straight through, except for a 7 hour nap last that night. The bright lights of Memphis appeared over a shimmering Mississippi River at a little after 1 AM Saturday morning, and we reunited with our dogs, exhausted but happy. That is quite a trip! !